Ok, so I am sure you noticed I am wearing two different pairs of sunglasses. Ha! We did pictures in this outfit and it was so windy and did't think I liked any so the next day we did them again and I decided to wear different sunglasses. Then when I was doing the post I liked a couple of pictures from the first set so I just decided to use them even though I had on different sunglasses. Sometimes taking pictures can be difficult. Especially because I live so close to the beach and it is always windy. I am loving this J.Crew skirt for Spring. Seersucker and eyelet in one skirt? Yes please! And it is in my current favorite color, blue. I live in skirts and dresses this time of year. 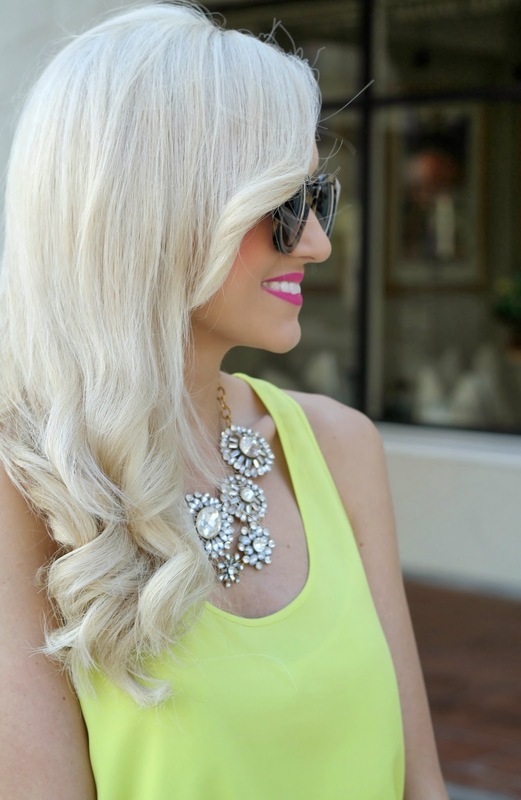 Also this tank top from Nordstrom is such a steal and comes in so many fun colors! It runs a little big so I would say size down. I got a xs. With this color I would say you need a tank tip underneath but I am not sure about the other colors. Now time for a fun giveaway! To start your Monday off right (and bright! 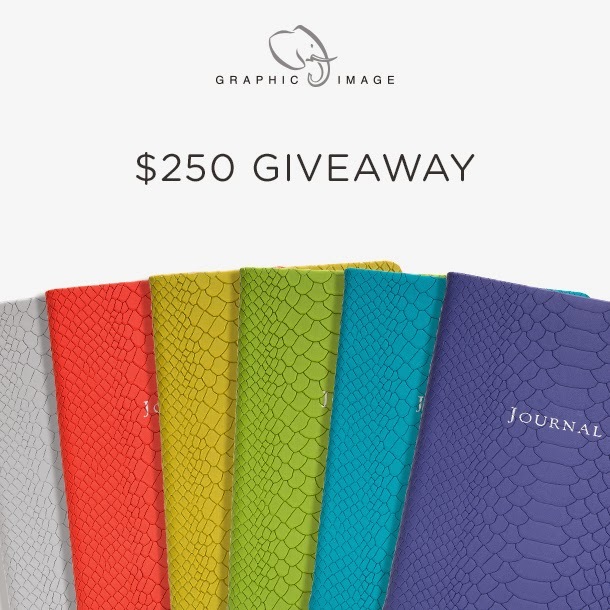 ), I've teamed up with 7 fabulous bloggers and Graphic Image to give away $250 to spend on their website! Graphic Image makes some of the cutest leather products such as calendars, planners, journals, iPad cases and iPhone cases. They also just released their amazing selection of spring colors that I'm sure you will be drooling over! To enter to win, complete the entries using the Rafflecopter widget below. The more entries you complete, the more chances you will have to win the $250 gift card! The giveaway will be open to all U.S. residents through March 7 at 12:00am CST. Good luck and thanks for entering! I am so jealous that it is warm enough where you live to where that outfit. You look great! Love this look! So pretty! That RM bag is to die for! I love the iPad Mini Case in Goldwash Embossed Python Leather! I love the embossed python iPhone cases! Dying over the Purple Hampton Travel Tote. So pretty! I love the Hampton Travel Tote! I always love your jewelry!! These rings are adorable! I'd probably get one of the journals. I love your 2nd set of sunglasses. Those are fun! Such a cute skirt! And your hair is amazing! I love the adorable journals. I like to keep a journal to write my blog post ideas in and one of these would be perfect! I just discovered your blog and am loving it! Fun giveaway! I love the soft color journals. And adorable outfit! Love the personalized iPhone cases! One of my favorite items is the Key Loops in Brights Leathers. I love the Pink Union Square Tote Italian Nylon! i like the passport holder in brown leather!!! So pretty!!! I love that skirt, too cute! Ooh boy I'm loving the Magenta Hampton Travel Tote!! The Jewelry Roll would be something perfect for me! There is so much cute stuff there though! Love your outfit as always! Those Tory Burch wedges are amazing, I think am finally going to splurge on a pair! I have heard they run small, have you found that to be the case? Thanks! Would absolutely love an iPad mini case - so cute! Love the luggage tags and passport cases! Love everything!! Cant just pick one thing!!! I love the tassel key chains! I love the business card cases! Love the spring colored journals! I always keep a journal in my purse to write down important info! I am terrible at deciding on a pair of sunglasses! I adore the leather bound pocket address books-precious! I love the python iPad case! Marigold Union Square Tote Italian Nylon is pretty. love that color on you and that skirt is so amazing, a summer staple! i am loving the hampton totes from graphic image, beautiful colors and great size! love the look, especially skirt! You're gorge as usual! looking so beautiful! love the bright colours! Love this outfit so much, love all the colors! one of the things i would get would be a hard bright business card case - i so need one!! Love this spring look, just wish it were warm enough here to wear it. The python travel journals are perfect! I love these colors, especially the top! I look forward to your post!!! Would never have noticed the different sunglasses if you hadn't pointed it out! Great giveaway... love the bright "A to Z" list notebook! I really like this planner: http://www.graphicimage.com/2014_Desk_Diary_Brights_Leather_Agenda_p/ddv-gti.htm. Where are the rings from that you are wearing on your right hand??? love the journals! I want one in every color! I love the Pink Union Square Tote Italian Nylon tote! Love these calendars! I'm in grad school and planning a wedding on top of working full time. One of these calendars is just what I need to keep me organized! I love the wire python notebook in lime! Perfect for spring. I deff understand the wind problem. It happened to me just the other day. As for this giveaway I could totaly use a new iPhone case so I hope I win. How are you able to keep your top tucked in so nicely? Love the color combo of the outfit! Dyingggg over your shoes.... Such a great giveaway; love the embossed python iphone cases! I love the A-Z list journal.... now the question is, what color? !